It's Day 2 of sneak peeks for My Creative Time February Release, and we are sharing the new Fun Tickets stamps and dies! These are so much fun!!! For my project today, I made a birthday card for my brother, featuring an envelope full of tickets. To make the envelope, I used the MCT 3 x 3 Fancy Envelope Die. Since my paper was not double sided, I cut out the bottom part of the envelope with one pattern and the top part from another. They are both from Simple Stories Awesome collection. Here's the ticket! I die cut the main ticket in cream cardstock and the layer in kraft. The fun part about this stamp set is that there are many premade ticket stamps, but also blank rectangular and oval tickets that allow you to use any small sentiments. Here I used one from MCT's Celebrate Good Times. I also die cut a cute little star button from the new Stitched Button Dies that are also being released on Friday. A little Thin Kraft Hemp from Liz's Paper Loft Boutique secured them to my envelope. "It's Your Day" is one of the tickets that comes with the stamp set. 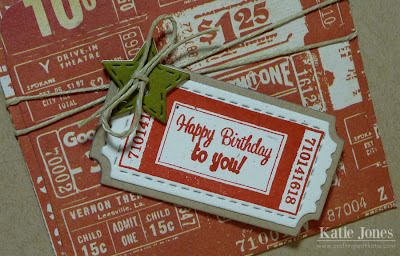 I used "Celebrate" from MCT's Teeny Tag Greetings in the center of the ticket with the oval shape. These are so much fun to play with, and I'm sure they will be popping up in a lot of my projects! Love the doggy BD card! The bone is adorable. Love this card! This ticket set is AMAZING!! So many different things can be done with them. can't wait to see what else you wonderful ladies have in store for us! I can not wait for this release! I love what you have done! So cute! Thanks so much! How much fun is this!!! I LOVE these new ticket dies and your card is just awesome! GREAT colors and papers and of course perfect embellishments! Whoa what a cool birthday card love your idea and literally packed with lots of wishes in the form of "Ticket Talk" very clever love them comin' out of the pocket now I have to get the pocket die. Girl you are very clever and creative!! What a cute little envie full of tickets! This is so cute. Great job...love this release! such an adorable card. love these tickets. These tickets are so great. I've seen so many different ways to use them, and I love how you can mix and match the sentiments for the perfect fit. How fun! I really like your card, is very pretty, thanks for sharing great ideas! love your card Katie great job on it and the dies are to die for Love them!!! What a cute project! I am loving this new ticket die and stamps! What a great card love the ticket die! Very cute idea for a card and card. Love the new ticket dies and stamp set in this release. TFS! Kaite ~ well you know how I feel about this card but let me tell you again! LOL! Putting that envelope die on the front of a card with these tickets ~ LOVE, LOVE, LOVE!!! Souch a great idea !! The papers are so PERFECT for a man too ~ your borther will ADORE his card ~ if not send it my way!!! LOL!! Yet another AWESOME peek! I am loving this card!!! I can't wait to get the new stamps and dies and then scraplift your idea! Thanks!! I love this card! Very creative and such great colors. I love all the tickets peeking out of the little envelope. It's so neat how you incorporated different sentiments with the tickets. Fun envelope pocket theme too! I can't wait for the release. Your card is amazing. I MUST HAVE this ENTIRE release.. it AMAZING! I love the paper and the colors of this card. It is gorgeous. Thanks for sharing and inspiring. Love this card, so nice for male or female of any age. Love your card and I'm sure your brother will love it too. The tickets worked so well on this card. So pretty! LOVE the gorgeous colors!!! So pretty! Love this card. Super cute card - really loving the ticket die! Thank you for sharing. I like the envelope full of tickets and the paper you used. Awesome job! love the pocket & ticket idea!! TFS! 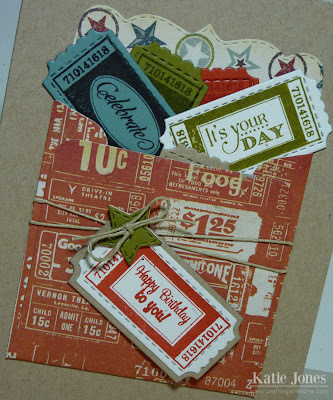 Pretty card, the ticket die is amazing and I love how you incorporated the different tickets into the pocket on your card! Gorgeous card to showcase the new releases. And the paper - that just adds to the overall impact. Love it! Love how you used the envelope die! So very cute! Great card. I love all those tickets! Darling card,your clor combo is so pretty! Love all the details of your great card. What a fun card! 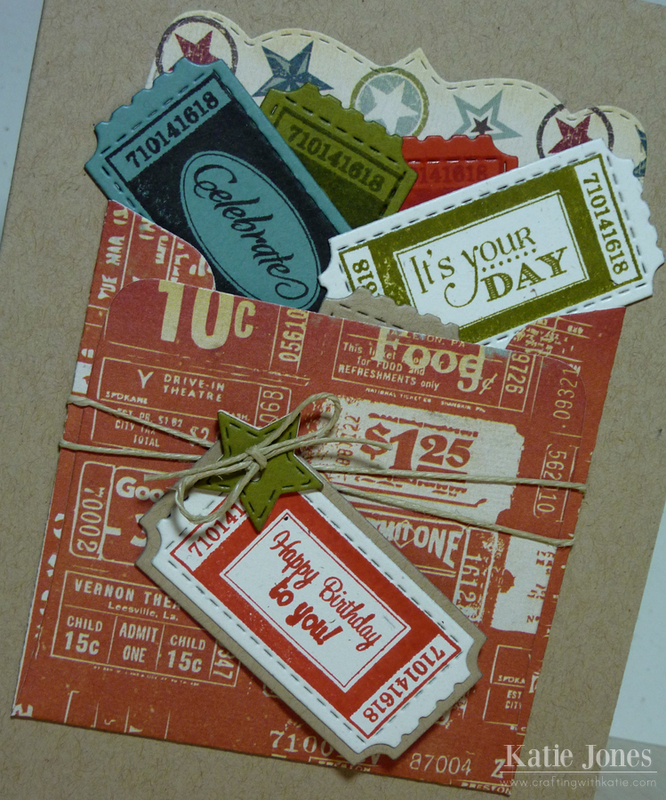 Love the wide variety of the Fun Ticket stamps, both the sentiments and the fonts. Emma outdid herself, again! This card is awesome. The colors are beautiful. Your Brother will love his card...it is so cute and clever. I am going to love the tickets and stamps. The buttons look like lots of fun and useful too. Great job! Such a cute card:) I love how you used the tickets! Can't wait to see more!! What a cute card. These ticket dies are fabulous. oh my goodness katie, this is to stickin' cute! I would have never thought of using the envelope on top of a card! Love the use of the envelope as a ticket holder, great job. I love this!! so cute and I love the colors! Love love these tickets!! Thanks for all the great ideas of what can be done with them. Love the paper with all the great tickets. Katie, what a gorgeous card. I like the way you used other stamps and that they fit the ticket. That is awesome! Katie, you come up with some of the cutest things. I love the envelope full of the tickets! Very beautiful. Love the way you combined the old with the new dies. Super cute! Love all the ticket sentiments! Thanks for the creative ideas! I can't wait to see this release! You did a great job as always! What an ADORABLE card! 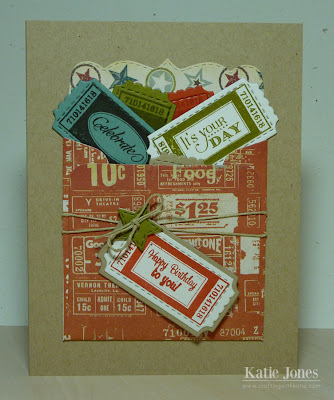 I love that you used the fancy envelope die as a pocket to fill those awesome tickets....LOVE IT! You are always so creative and inspiring! Thank you! :). Have a wonderful day! These dies and stamps are just the best...love all the tickets and buttons and the 'jar' is super!!! Very cute projects! I would never have thought of using the envelope die this way--you are so creative!! This opens up a whole new way to use this! Thanks for sharing!